The food and drink may be the star of brunch, but decor is equally as important to me. 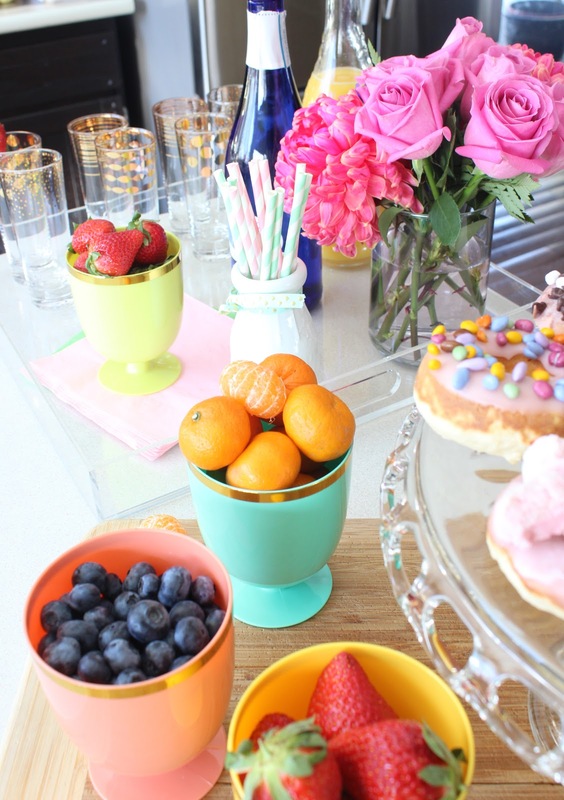 Since winter blues are no match for the bright and colourful I loaded bright Oh Joy for Target goblets with fruit, and let the colours really contrast. I also have collected quite the selection of paper straws and napkins, so I picked out my favourite colours- mint and pink. 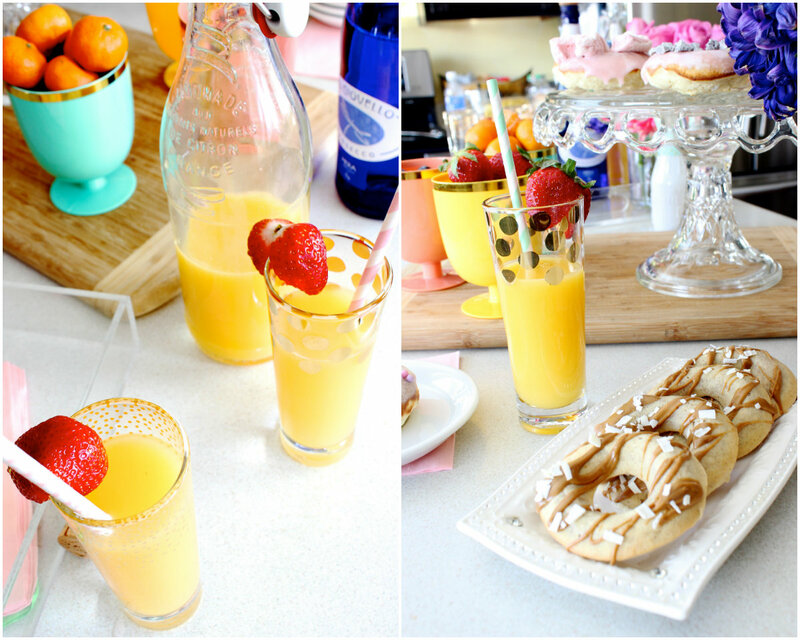 I swapped the OJ out of the jug and funnelled it into a glass bottle to complement the glass celebration glasses. This made the table instantly look more classy. Lastly, since flowers are the epitome of Spring to me, and always lift my spirits, I put together a few bouquets in some bright pinks and purples to encourage bright and happy thoughts. If you follow any west coast bloggers on insta you must have seen California Donuts pop up a few hundred times. If not, to sum it up- they are a retro style bakery/donut shop serving the wildest creations. Since I unfortunately don't foresee myself heading to Cali anytime soon, I took the liberty to re-create the experience at home. Some of my toppings included: classic sprinkles, Lucky Charms, marshmallow, s'mores, chocolate covered sunflower seeds and cookies and cream… the more toppings the better! I used the donut cake recipe found here, and a classic vanilla glaze recipe. Not going to lie… I was pretty thankful for all the toppings, because I found the donut to be too dry. 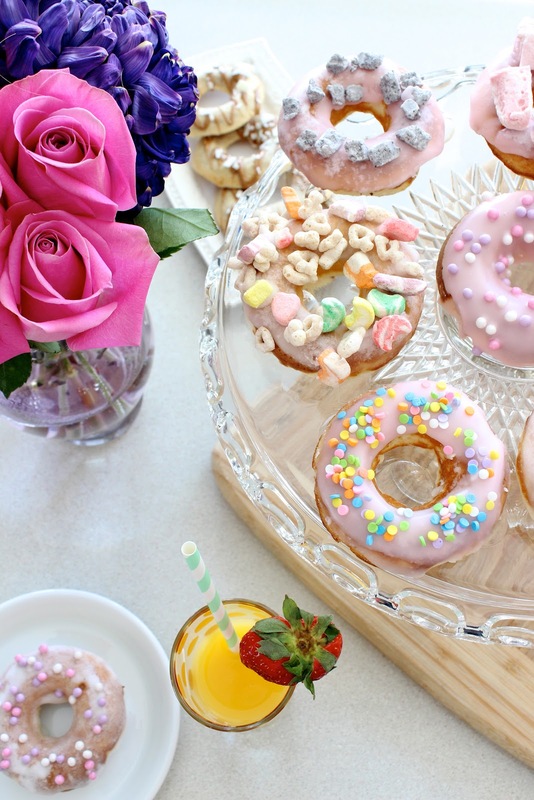 Even though my family enjoyed them, I'll be searching for another baked donut recipe (have one? send it my way!). I also made a batch of skinny vanilla donuts and drizzled them in cookie butter and sprinkled them with white chocolate flakes (they are the flat, odd looking things in the pictures). Confession- I actually liked these more than the cake donuts! The vanilla flavour is strong, and I don't need to tell you how obsessed I am with cookie butter… (for this recipe I substitued whole wheat flour with gluten free flour which resulted in the donuts not rising as much) They were very dense, but full of flavour. 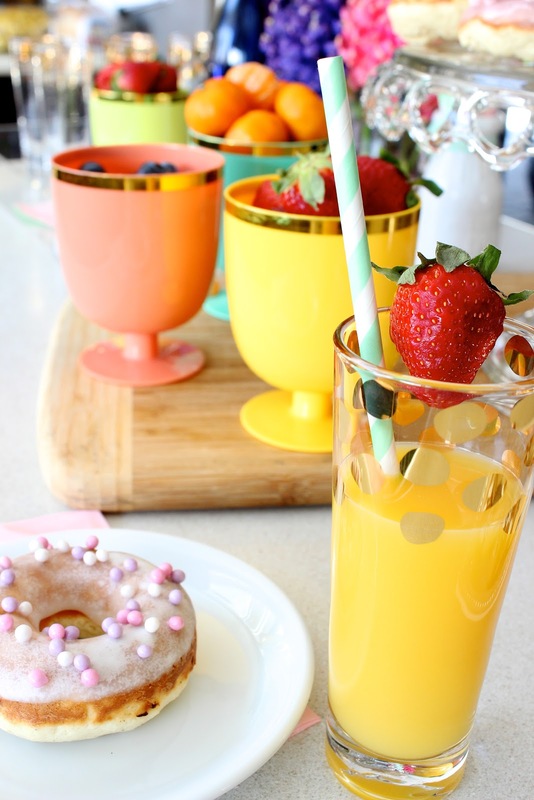 We stuck with the traditional brunch drink, the mimosa. Top with berries, and a colourful straw. 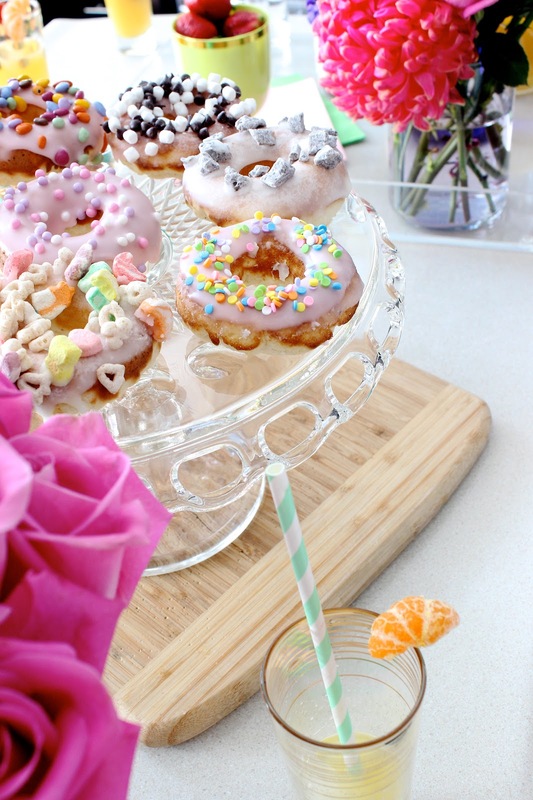 Pretend Spring is here for an afternoon and have yourself a little Spring inspired brunch this weekend! If the sun is shinning who can tell what the temperature is from the indoors? WOW - this spread is honestly what dreams are made of! You've inspired me to dust off my doughnut pan and give baking another try! They definitely were a treat! That's it - I'm hosting a brunch! Okay, this post is total swoon worthy. I LOVE this. How fun! !